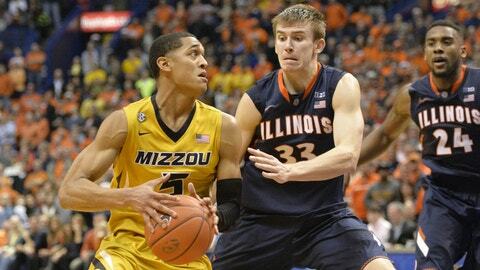 Despite Jordan Clarkson's 25 points, six rebounds and eight assists, the Tigers lost narrowly to the Illini in the 33rd Braggin' Rights game. ST. LOUIS Rayvonte Rice pulled his jersey over his head during the celebration, showing off an Illinois tattoo. "It was a big game," Rice said after Illinois beat No. 23 Missouri 65-64 in the annual Braggin’ Rights game Saturday. Rice got a chance to celebrate because teammate Tracy Abrams kept his emotions in check. Abrams made two free throws with 4.6 seconds left for the decisive points. "I was very confident," Abrams said. "I went to the line confident I’d make them." Abrams scored a season-best 22 points and Rice added 14 points for Illinois (10-2), which snapped a four-game losing streak in the 33rd renewal of the annual neutral-court matchup. "The emotion of that environment can get you to maybe do some things or make a play that’s not there, that’s the one thing I’ve come to understand," said Illinois coach John Groce, who’s 1-1 in the series. "A lot of times it comes down to toughness and players making plays." Jordan Clarkson had 25 points, six rebounds and a career-best eight assists for Missouri (10-1), which entered the game as the lone unbeaten school in the SEC. Earnest Ross added 13 points. Missouri coach Frank Haith said twice that his players would be "sick" when they reviewed the game. "It is emotionally draining," Clarkson said. "That’s a tough way to lose. But we got to have short-term memory." Illinois scrambled on its final possession but got a bit of a break when Abrams was fouled by Johnathan Williams III driving the lane. Abrams was 7 for 10 at the line. Jabari Brown’s 3-pointer with 15 seconds to go gave Missouri a 64-63 lead and answered a 3-pointer from Illinois’ Jon Ekey with 48 seconds left. "It was definitely intense out there," Ekey said. "Probably one of the craziest games I’ve ever been a part of." Missouri mishandled its final possession. Tony Criswell’s inbounds pass was behind Clarkson and Criswell ended up with a desperation 3-point attempt from well beyond the line that missed everything at the buzzer. Clarkson was the intended shooter. "Tony didn’t make a really good pass," Haith said. "I thought if we’d have gotten that play off clean, he would have had a chance to make a play." The point total was a season-low for Missouri, which scored 72 or more its first nine games but beat Western Michigan 66-60 in its previous game. Illinois was unranked for the pre-Christmas game for the first time in four years, and perhaps learned from a loss at No. 15 Oregon its last time out. The last four years, the schools entered with a combined 72-7 record. Illinois leads the series 21-12. Among those attending were Hall of Fame baseball manager Whitey Herzog, Missouri Gov. Jay Nixon and the football coaches from both schools, Missouri’s Gary Pinkel and Illinois’ Tim Beckman. The schools traded runs in the second half that kept it tight, 10-1 by Missouri to go up by near the midway point and 9-0 by Illinois with a pair of three-point plays by Abrams for a two-point lead with 6:17 to go. Illinois climbed out of an early hole behind 3-point shooting, hitting six of its first 10 – by six players – and led 31-27 at the half. Missouri led 8-0 and had a nine-point cushion at 15-6 after Rice’s second foul with 13:47 to go in the half. "I thought we looked a little tentative," Groce said. "They came out like gangbusters." Illinois answered with a 10-0 run the next 3 1/2 minutes, including 3-pointers from Kendrick Nunn and Abrams, and scored seven in a row late in the half for a six-point lead ended by Clarkson’s driving basket with 5 seconds to go.